Guns N' Roses have reformed for a pair of lucrative festival slots. Could another album be next? Axl Rose is “regrouping” with former bandmates Duff McKagan and Slash after years of estrangement, to play a pair of shows at the Coachella festival in April. To those who’ve followed the years of acrimonious back-and-forth between the band members and the unedifying comments that have flown between the two camps, it seems like the impossible has happened. To those who grew up watching VHS tapes and — more recently — grainy YouTube clips of the 80s and 90s incarnation of the band, it feels like all our Christmasses have come at once – never in our wildest dreams did we ever think that we’d get the chance to see Slash, Axl and Duff sharing a stage again. It’s the last great rock’n’roll reunion, the holy grail that always seemed tantalisingly out of reach. Short of Freddie Mercury returning from the grave or Robert Plant giving Jimmy Page a call, it’s the big one. And yet… while the Coachella gigs are undoubtedly going to be a big draw, the most exciting thing about this regrouping is the prospect of new music from the band. In their 31-year history, Guns N’ Roses have put out six studio albums. One of those was a pair of EPs bolted together, one was a covers album and two were released on the same day. That the band is still so well-regarded despite such a scanty discography speaks to the potential for more. They’re not short of material, either. “I’ve always thought of [Chinese Democracy] as a double,” said Axl in a web-forum chat with fans – and various accounts have said that there’s anything from 20 to 100 songs or fragments of songs sitting in his vault of recorded material. Axl himself has confirmed the existence of songs with titles like The General, Atlas Shrugged, Down By The Ocean (co-written by Izzy Stradlin, no less), and the intriguing Elvis Presley and the Monster of Soul aka The Soul Monster. The question is what they do with those tracks – rip them up and start from scratch, or get Slash and Duff to re-record elements of them (as late-arrival guitarist Bumblefoot did on Chinese Democracy, adding to and reworking Buckethead’s guitar licks). Slash and Duff, meanwhile, have a library of unused material too. Back in 2003, they recorded tracks with Izzy Stradlin for The Project – the band that would eventually become Velvet Revolver. Slash has called it the best Guns N’ Roses album Guns N’ Roses never made, and much of it was abandoned when Scott Weiland came on board. How much of that material found its way onto later projects like Slash and Duff’s solo albums is unclear, but they also recorded around ten songs with Corey Taylor for a Velvet Revolver revival that never got off the ground. That’s a lot of music that could potentially keep Guns N’ Roses ticking over in the studio for years to come. And the best part is: we might actually get to hear it. That last sentence is telling – it’s not hard to imagine that the record company would prefer to sell a reunited Guns N’ Roses over the Chinese Democracy-era line-up. The return of Slash and Duff to the fold could open the floodgates; not just for new material, but for reissues, best-of collections and live DVDs. There are plenty of rumours flying around about the rest of the band’s line-up, with social media posts pointing to the involvement of drummer Frank Ferrer, guitarist Richard Fortus, keyboardist Dizzy Reed and multi-instrumentalist Chris Pitman. 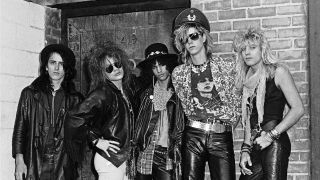 Former manager Alan Niven has suggested that Izzy Stradlin may be involved in some capacity, while various industry insiders have claimed that negotiations are underway with Steven Adler. The suggestion that the core of the band may be made up of Chinese Democracy-era musicians has riled some fans – which seems misguided. Assembling a solid, proven touring band with guest spots for the Appetite-era stars makes a good deal more sense than trying to recreate the volatile chemistry of the “Most Dangerous Band In The World” three decades on. And it suggests that this is a forward-thinking move – one that’ll hopefully result in new material built around the core of Axl, Slash and Duff, with contributions from Izzy. I hope so – there’s so much potential in this band that hasn’t been explored yet.